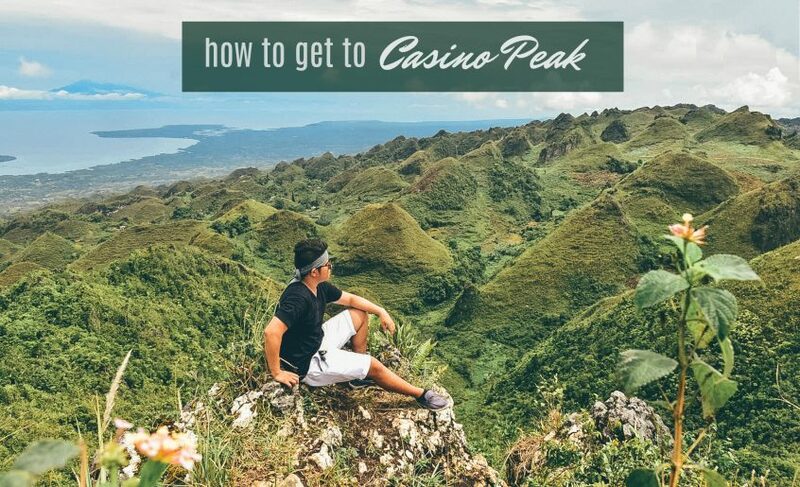 I remember seeing the area where Casino Peak in Dalaguete, Cebu is a located a few years ago but I didn’t know its name that time and how to get there. 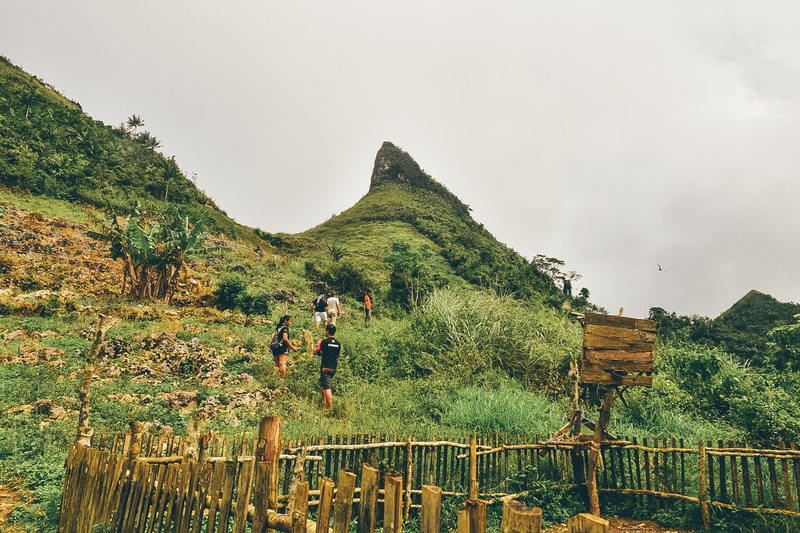 We were among the first few travelers who visited Osmena Peak that time. 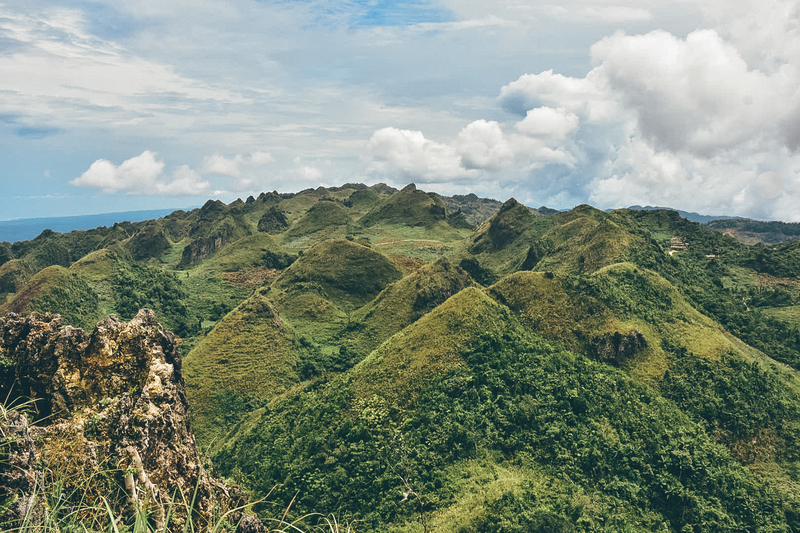 I noticed the mountains on that side are similar to Chocolate Hills of Bohol, while Osmeña Peak is more like deformed Hershey’s Kisses. So when a friend mentioned about Casino Peak recently, I was no longer surprised. But since I really wanted to see it too, I planned a trip to Dalaguete with my cousins and uncle. I created a day trip Casino Peak itinerary with estimated budget. 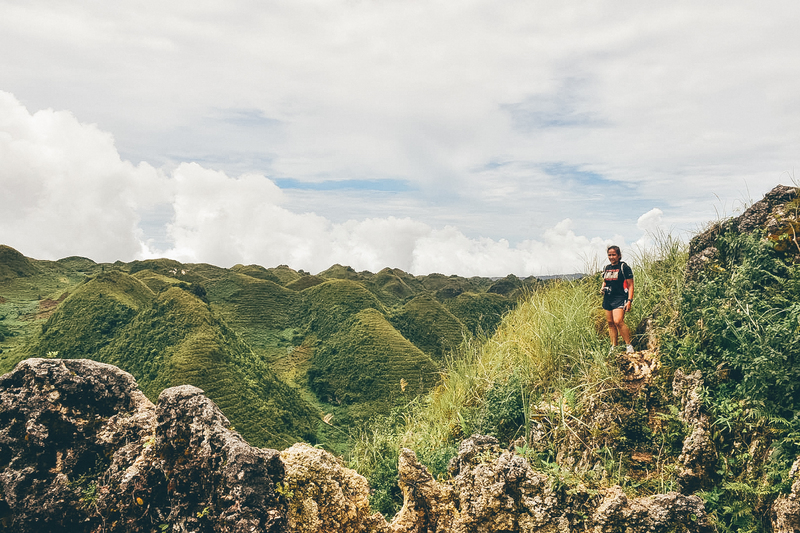 For those who don’t know, Casino Peak is near Osmeña Peak, they are both located in the town of Dalaguete in South Cebu. You can actually travel to both tourist spots in 1 day or even half day (if your pace is fast). 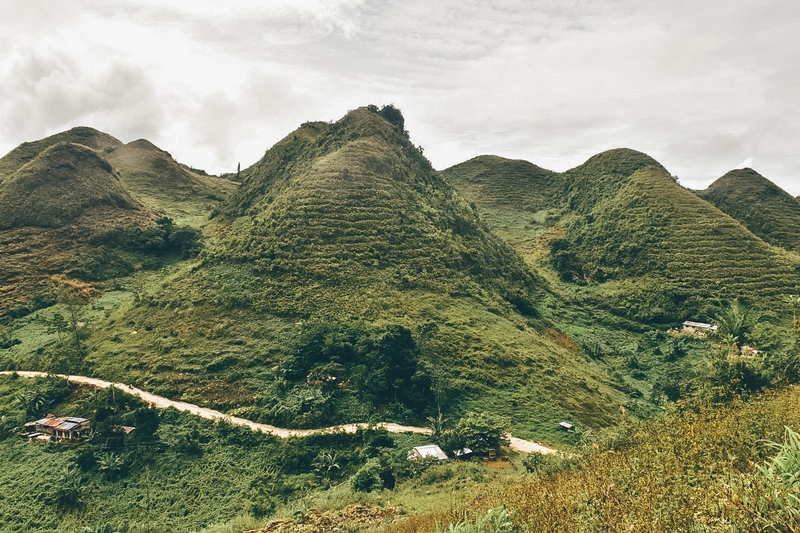 Casino Peak is situated in Sitio Lugsangan in Barangay Tabon while Osmeña Peak is situated in Barangay Mantalongon. Since Casino Peak is new to the tourism scene, there are no standard rates yet. I spoke with our local guide and he told me that the village is still talking to the LGU regarding the environmental fee, entrance fee and the standard rate for guide fee and motorcycle fees. Hopefully soon enough, they’ll be able to impose reasonable standard rates. Here’s my Casino Peak trip guide to help you plan your trip. There are direct buses to Mantalongon in Carbon Market as well as South Bus Terminal. Bus fare is around PHP 120 /USD 2.34 (EURO 2/MYR 10/SGD 3) and the trip will take approximately 3 hours. The bus will stop at Mantalongon Market where you can hire habal-habal (motorcycle) to Casino Peak. Fare is around PHP 50 /USD 0.98 (EURO 0.82 /SGD 1.32/MYR 4) per person per ride. But drivers may charge you PHP 70/USD 1.37 (EURO 1.14/SGD 2/MYR 6) per person per ride since you are a tourist. Transit time is about 20 minutes. 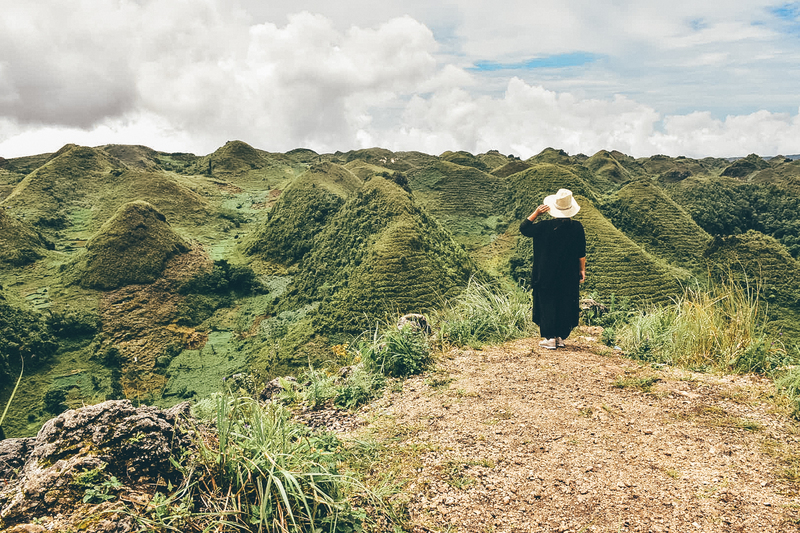 Once you reach Sitio Lugsangan where Casino Peak is located. You need to register at the house of the village chieftain. You will be assigned a guide. But there’s no standard rate yet. Some say it’s like in Kandungaw Peak where the minimum guide fee rate is PHP 150. Hike will take about 30 minutes depending on your pace. I took a lot of photos so I reached the summit around an hour after. PHP 150/USD 3 (EURO 2.45/MYR 13/SGD 4) (just like in Kandungaw Peak). Me thinks PHP 300/US 6 (EURO 5/MYR 25/SGD 2) is a fare rate already if you a group of 5. If you miss the bus to Mantalongon, Dalaguete, don’t fret because you can also ride the bus to Barili via Oslob. Make sure it is via Oslob because that’s the bus that will pass along Dalaguete. Bus fare from Cebu City to Dalaguete is roughly PHP 120 /US 2.34 (EURO 2/MYR 10/SGD 3). Travel Time is around 2 hours. Tell the conductor you are alighting at Dalaguete. Get off at or near 7/11 in Dalaguete. Charter a tricycle to Mantalongon Market. Fare is roughly PHP 50 /USD 0.98 (EURO 0.82 /SGD 1.32/MYR 4) per person per ride, but some motorcycles may charge you PHP 70/USD 1.37 (EURO 1.14/SGD 2/MYR 6) per person per ride. That’s a good rate already considering the ride to Mantalongon Proper will take almost 1 hour. They don’t provide helmets. At Mantalongon Market, charter another habal-habal (motorbike) to Casino Peak. Fare is PHP 50 /USD 0.98 (EURO 0.82 /SGD 1.32/MYR 4) per person per ride but some motorcycles may charge you PHP 70/USD 1.37 (EURO 1.14/SGD 2/MYR 6). Ride will only take about 15-20 minutes. If you want to charter a motorcycle directly to Casino Peak, negotiate with the driver. 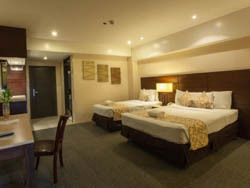 The usual rate is PHP 150/USD 3 (EURO 2.45/MYR 13/SGD 4) per person. So that’s PHP 300/US 6 (EURO 5/MYR 25/SGD 2) per motorbike. If you are a party of two, that’s already a good rate since you don’t need to switch and look for another driver at Mantalongon. At Casino Peak in Sitio Lugsangan, Brgy. Tabon, Dalaguete, you need to register. Entrance is free as of the moment. They will assign you a guide for your safety. No standard rate but usually the minimum rate for local guides in Dalaguete (like in Kandungaw Peak and Osmena Peak) is PHP 150/USD 3 (EURO 2.45/MYR 13/SGD 4). I think PHP 300/US 6 (EURO 5/MYR 25/SGD 2) is already a good rate. One guide for about 5 – 6 hikers. The hike is an easy one, will take about 30 minutes. But be extra careful as the trail is slippery and rocky. Wear proper hiking shoes and outfit. I had a hard time because I was wearing a long pants and my shoes was slippery. Here’s a sample itinerary for Casino Peak. You can adjust this base on your availability and budget. 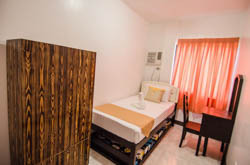 This sample itinerary is supposing you are taking the bus that will pass by Dalaguete Proper and you will hire a habal-habal (motorcycle) directly to Casino Peak (Sitio Lugsangan). 10:15 AM ETA Casino Peak trailhead. Register and hire a local guide. 11:00 AM ETA Casino Peak. Photo op. 12:00 PM Hike down. Pay guide fee. 01:45 PM Take bus back to Cebu City or go to next destination. Here’s a list of possible Casino Peak trip expenses to guide you in planning your itinerary and budget. Note that you will not encounter them all as it depends on the transportation that you will take and the guide fee is up to you. ⊗ There is no store yet at the base of Casino Peak so bring your own drinking water. ⊗ Please do not leave trash anywhere. ⊗ Stick to the trail to avoid stepping on crops and vegetables. It’s surrounded by a vegetable farm so please be mindful of your steps. ⊗ Hire a local guide for your safety. It’s a way of contributing to the local economy since there is no entrance fee anyway. ⊗ Wear proper trekking shoes and outfit. ⊗ Bring sunblock and hat to protect yourself from the sun. ⊗ Greet the locals politely. Make way for them especially when you see them carrying basket full of vegetables.